R code tends to be very memory intensive as R processes primarily in memory. If you want R to perform well, you want as much memory as you can get your hands on to run your code, especially with larger datasets. This is a problem as many individual laptops have pitifully low memory capacity, and unless you have a computer with say as much memory as you can put in this one, if you are analyzing large datasets you may run out of memory. If a new computer is not in the budget, why not develop on the server? You may be thinking that there is no way the administrator of the box is going to provide you the means to be able to use the server memory. Well, if you have a SQL Server 2016 with R Server installed, chances are you can use the memory capacity of the server by connecting your R process to run on it from your computer, without the need to install anything on the server. Microsoft’s R Server contains some specialized functions which are not part of the standard CRAN R installation. 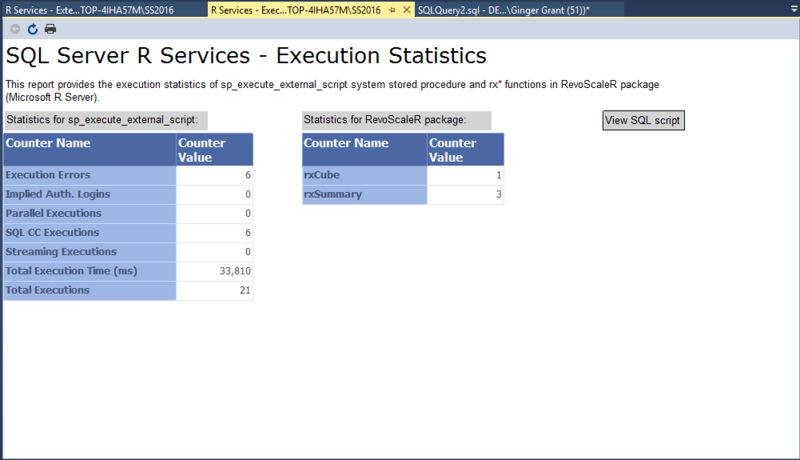 One of the ScaleR functions, RxInSqlServer will allow code to be processed on the server from the client. To make this work, you must have R Server and R Client installed. If you are doing a test on a local machine, you will need both R Client and R Server installed on that computer. #Check to see what the compute context is. Not this is for informational purposes. You do not need to do this to make anything work. #Until the context is switched back, I am now running on the server, not locally. Here’s the output I get back in the R interactive Window. Let me know if you found this post helpful, by posting a comment. Thanks also to Mario, who asked me about context switching which gave me the idea to answer his questions on this site. If you are interested in seeing more information about SQL Server and R, please subscribe as I tend to answer more of the questions I receive here. Recently, I did a webinar on Machine Learning and R. I received a number of questions during the presentation. Due to time constraints, I was unable to answer all of them, so I have provided the Question and Answers here. Question: Can I Use R in SQL Server to plot non-linear regression curves? We use IC50 and others in Michaelis-Menten kinetics for bio-chemical work. Question: Can you execute/invoke an external R script from T-SQL? Question: Is it possible to run R processes in diffrent boxes other than SQL Server itself for scalability reasons? You have the option of installing the R Server on another server. Just keep in mind that you do have to account for the additional overhead of moving all the data over the network, which needs to weigh in on your decision to move processing to a different server. 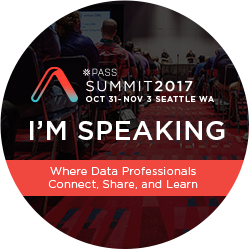 Question: Can we join data generated from an R script to SQL data directly or does it have to be inserted into a table first? Data generated from an R script interacts with the data the same way other data in a stored procedure does. It is not necessary to write the data to a table for the data to be processed. 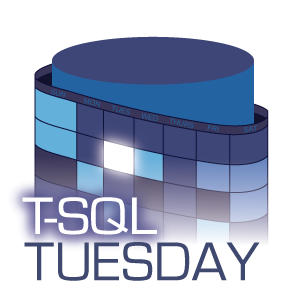 Question: When would you use R Server versus R on SQL Server? R on SQL server is an implementation of R server. When running R on SQL Server, R Server is running. Question: What is the maximum file size I can load on R server? R Server uses SCALR which provides the ability to not only use memory but also use disk storage, providing nearly limitless capability for file size processing. Question: Is knitr integrated or can it be integrated into R for SQL Server? While you can install the knitr library on SQL Server to implement the functionality provided, there is no direct integration path for incorporating the wide functionality knitr provides within SQL Server. For more information about knitr, please see this link. Question: Does MS R Open have all the functionalities of CRAN R? Does it support all packages? Question: Do you have a link for the Microsoft Machine learning cheat sheet? Sure. The link can be found here. Question: Why Use Microsoft R Open over other Analytics Tools such as Open R, Python, Matlab? Microsoft R Open is fully CRAN R compliant, and also multi-threaded and faster, providing a clear benefit over CRAN R. Python is a great tool for data analytics, but unlike R, it is not designed solely for statistically analysis but has a wider functionality scope. R is focused solely on providing statistical data analysis. Matlab is a great tool, but given its complicated user interface and high licensing cost, many users may gravitate towards R, as it is free and there is a lot of good support for learning R available online as well. 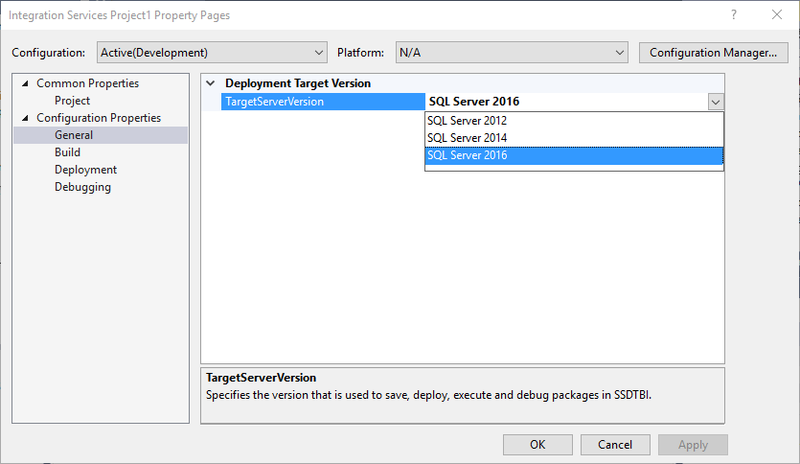 Question: Can R be used with older versions of SQL Server or only 2016? While it is possible to use R with other versions of SQL Server using tools such as RODBC, the R Server and full integration of R in SQL Server is only available in SQL Server 2016. Question: Do I need all R server and R client and Microsoft R Open to be installed to run R from SQL Server? To run R on SQL Server, R Server needs to be installed. For more information on how to install R on SQL Server please see this link. To connect to the server and use the SCALR functionality, the client machine will need to have R Client installed. 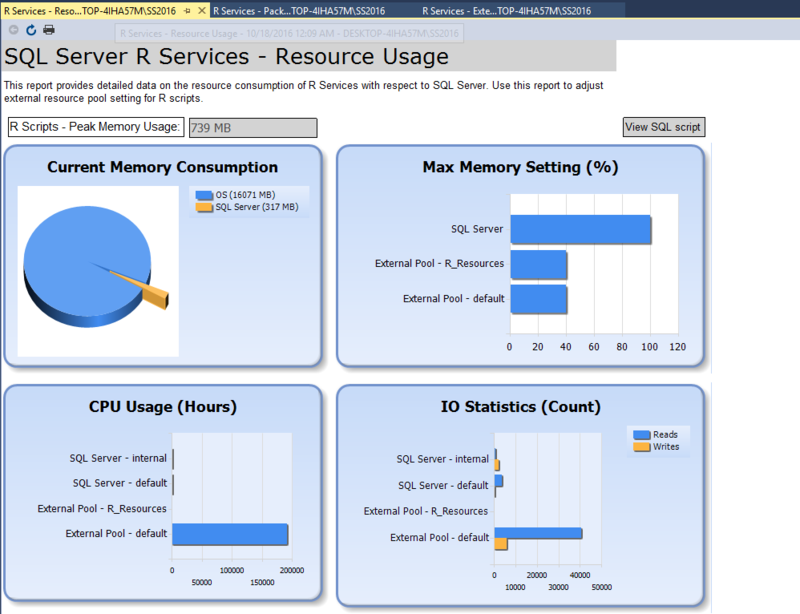 Question: What are the benefits of Microsoft Standalone R Server? 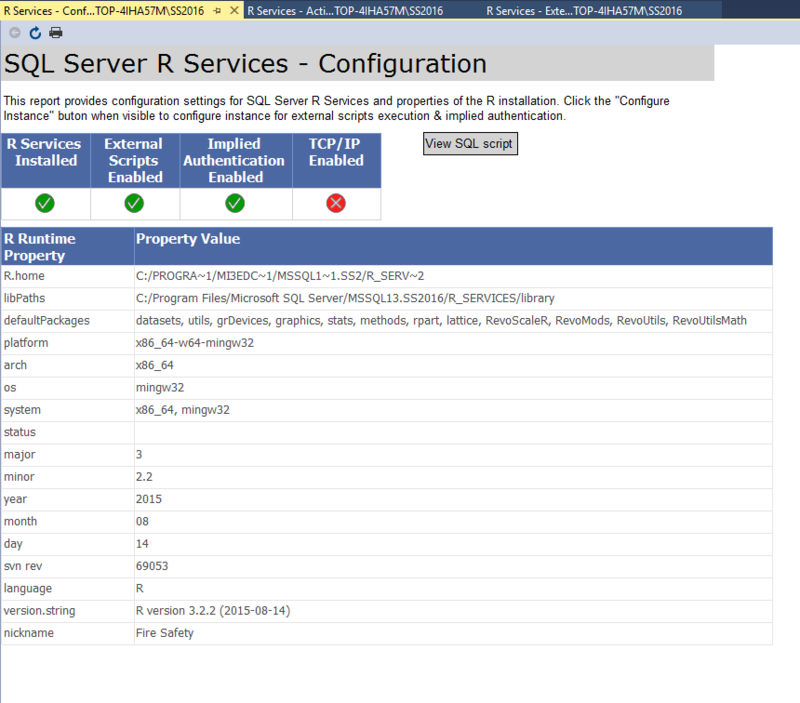 R Standalone Server is available to connect to data stored in HDFS and Teradata in addition to SQL Server. To incorporate data from other data sources and provide the ability to process more data than one has memory, it might make a lot of sense to deploy a standalone R Server. Question: Are there any memory limitations in R when handling big data? R is designed to run in memory, meaning if you have more data than memory you may run out of memory. When running using the SCALR functions, memory and disk are used to provide nearly limitless ability to process data. Question: Can one call R from Python? While it may be possible to create Python code which calls R, I am unaware of the syntax. This functionality would not be supported in the context of SQL Server. Question: Can you use R charts in SSRS? Question: Any classes like “R for the nervous DBA” that you can recommend? I have a statistician who is running R on my SQL server. 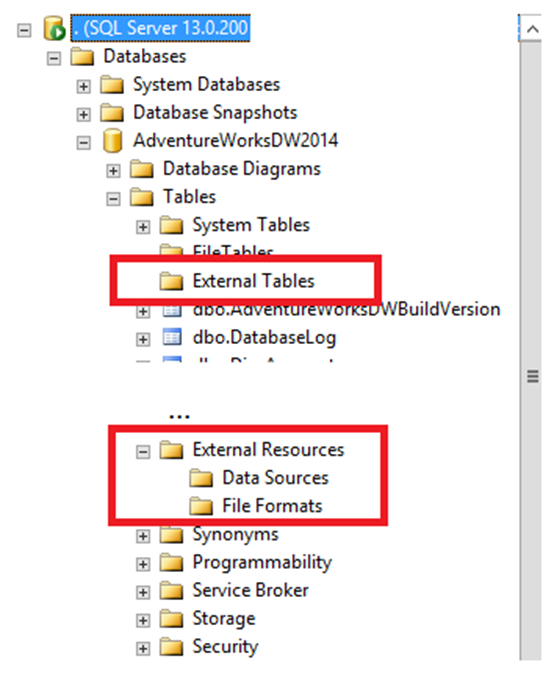 I do not know of any R classes specifically designed for SQL Server DBAs, but I am working on a post for additional configuration information which you might find helpful. Please check back in a few weeks for updates. Question: What is a Pirate’s favorite language? RRRRRR Mad Props to Phillip for sending me a pirate joke. I love pirate jokes. I feel compelled to tell a few when I am presenting R and I have been told all of mine are really bad. If you have any additional questions about SQL Server and R or any pirate jokes, please comment on this post or send me a message via twitter @desertislesql. Whenever I talk about R, in the question and answer period I get a lot of questions from DBAs on how to monitor the impact of running R code on SQL Server. 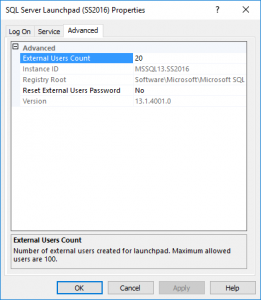 Fortunately Microsoft recently created a series of custom reports for SQL Server which provide a lot of useful information on how R is running on SQL Server. The custom reports are available on github here in a folder called SSMS-Custom-Reports. There are 8 different reports: R Services – Active Sessions, R Services – Configuration, R Services – Configure Instance, R Services – Execution Statistics, R Services – Extended Events, R Services – Packages, R Services – Resource Usage, R Services – Script. 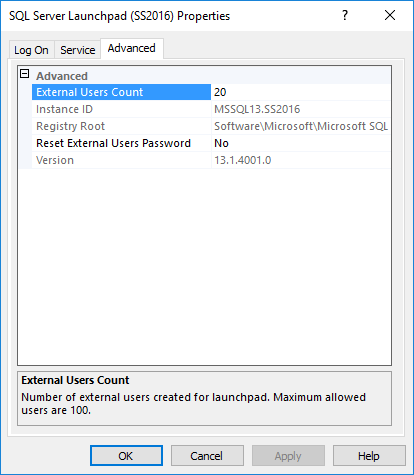 If it has been a while since you have added a custom report to SQL Server, this link should help you get the reports installed. The titles for the reports provide a good indication of what they do. Active Sessions will show how many users currently have their compute context set to run on the server. Configuration shows the current R Configuration, which is very useful information for checking on the R components on the server. The report R Services – Configure Instance is for configuring R for the first time. If you have R setup already, chances are you won’t need this report, as it is really not a report but a script you need to run to configure R. R Services – Execution Statistics is a really neat way of monitoring the ongoing use of R. It keeps track of every time R is run on the server. If you run an R job then refresh the report, the execution count and time will go up. The last report R Services – TSQL Script is a bit of a mystery. The screen contains this line of text. This is the T-SQL script for generating the data in report: No Report . I don’t know what was the intent of the report. The Readme.md in github provides this documentation about the reports. Custom reports for SQL Server R Services built using SQL Server Report Builder. The reports can be added to SQL Server Management Studio to view various configuration and runtime information about R scripts execution in SQL Server. That doesn’t provide any clues to me as to what the intent of the report is, so you may want to skip installing it altogether. If anyone does figure out how this report can be used, please drop me a line as I am curious. 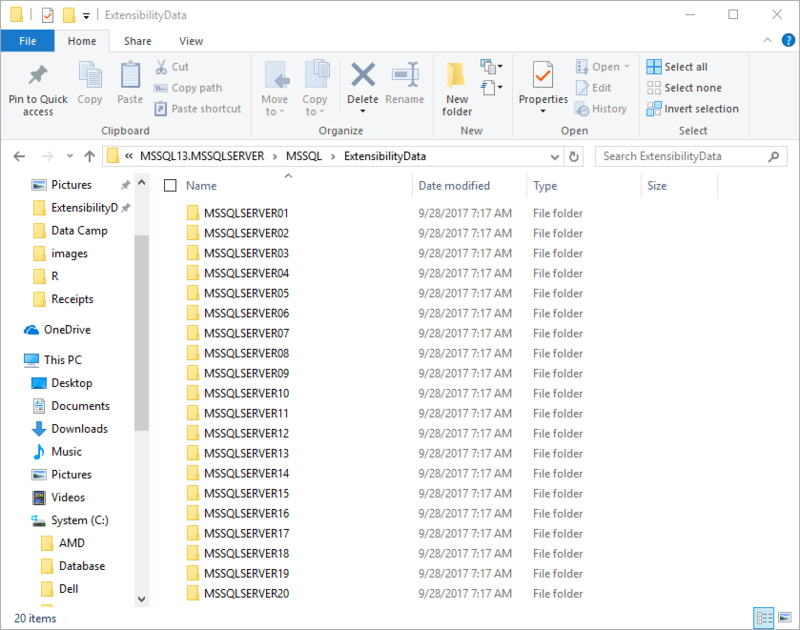 I was really excited when I found these reports and I think that they provide a lot of valuable insight for monitoring R on SQL Server 2016. While R is an open source language, there are a number of different versions of R and each handles memory a little differently. Knowing which version is being used is important, especially when the code is going to be migrated to a server. As part of a SQL Server implementation, there are three different versions of R which come into play. The first is standard open source R, commonly known as CRAN R. This is the standard open source version of R which runs code in memory and is single threaded. 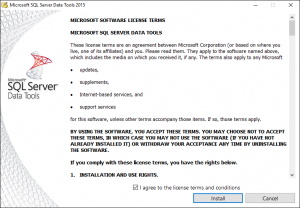 The next version which will be installed as part of a SQL Server Installation is Microsoft R Open. This version of R was written to take advantage of the Intel Math Kernel Libraries [MLK]. Using the libraries speeds up many statistical calculations which use matrix operations. It also adds multi-threading capability to R as the rewrite provides the ability to use all available cores and processors and process in parallel. More information on how it works and how much faster Microsoft R Open is compared to standard R is available here. To use Microsoft R Open, once it is installed, in Rstudio should automatically start using it. To check out what version of R that is in use, within R Studio, go to Tools->Global Options and look at the R version. R studio here is using Microsoft R Open. 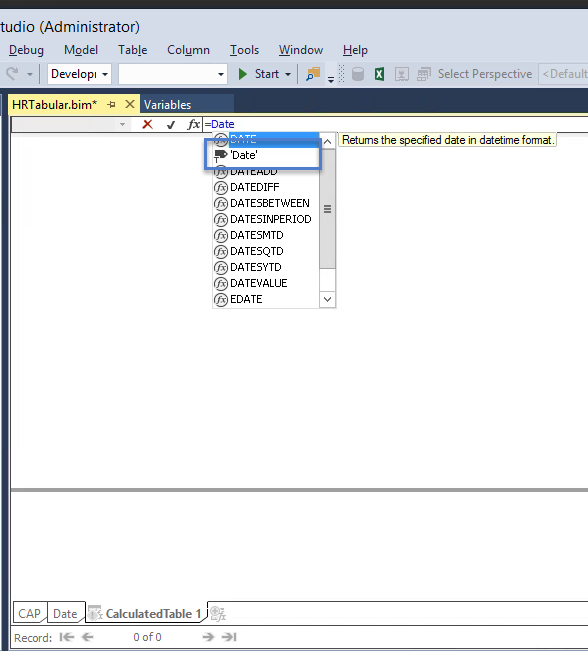 To take a look at the version in Visual Studio which has R Tools installed, go to Rtools and Options. Microsoft R Open is open source and can be used by anyone to speed up the execution of their R code. 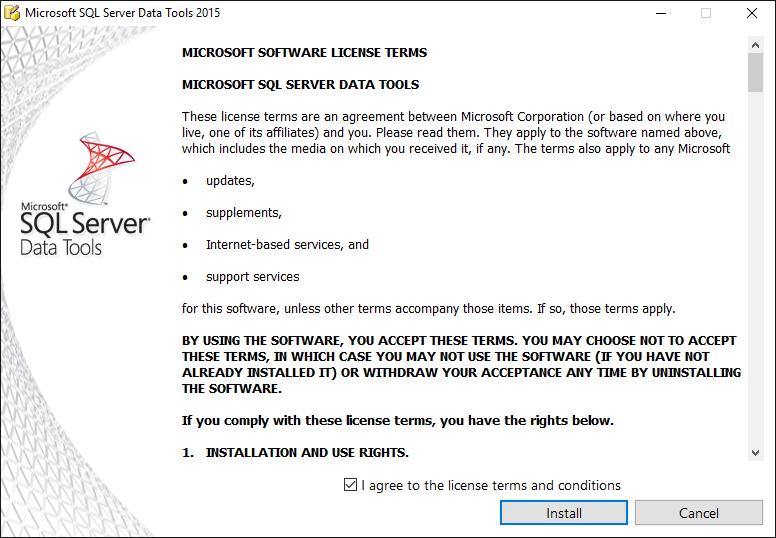 The version of R which is implemented within SQL Server is not this version of R. The R server version is proprietary, and Microsoft is not giving it way for free, as to run it on a server you need to purchase either SQL Server 2016 or R Standalone. That version is R Server. There is full compatibility on all of the versions of R. Code written in either CRAN R or Microsoft R Open will work in R Server. To write code for R Server, the R Client needs to be installed. The Visual Studio Screen shows this version of R installed on a PC which also is running SQL Server 2016 Developer edition. One of R’s strengths and weaknesses is the fact that R runs in memory. This is good thing because it means R is very fast. It is not such a good thing when you need more memory than your machine has. When reading through the product information surrounding Revolution Analytics’ version of R [Revo R] which Microsoft bought, one of the features is the ability of this version of R to be able to use not only memory but disk, by applying chunking logic. The code is broken into smaller pieces, executed then put back together. Using Revo R, it’s possible to do this by using the specifically designed functions which all start with rx which implement this functionality, known as ScaleR. This does not mean that all R code running on SQL Server will be using these functions. Chances are most of it won’t, especially if the R code is being migrated from the existing data science team. Prior to being bought by Microsoft, Revolution Analytics charged money for their product. 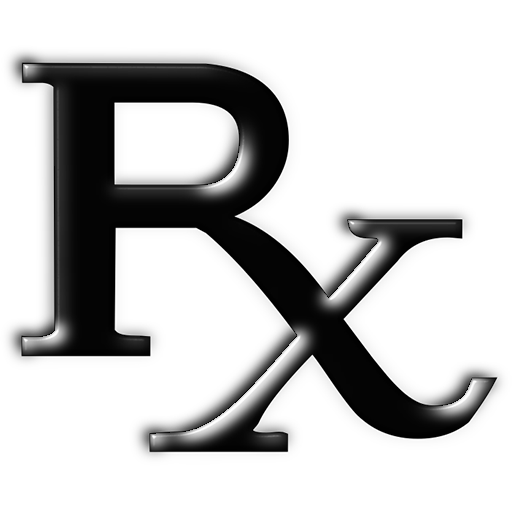 If your organization didn’t have a license, chances are no one was writing rx Functions. For people who don’t know anything about R, and have been asked to create packages to run R, there is an easy way to tell if the code has been written to use the chunking. If there are no words in the code that start with rx, like rxSummary, rxCube or rxHistogram to name a few, the code will not use chunking.